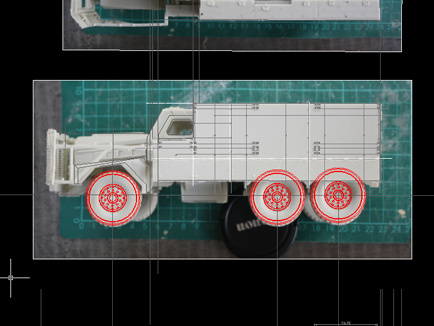 This full-detail model of the MASTIFF for BMT Defence Services includes detail down to rivets and shutlines on small electrical components. Models with this level of detail are rare, since most are illustrative and do not require a literal approach. No CAD or technical drawings were provided for this model, other than a hobbyists’ kit from which to pull approximate dimensions. All the CAD was built up from scratch in 2D and 3D design programs; the multi-faceted bonnet and chassis presented a particular challenge, due to their oblique angles and meeting points. The model includes a flocked and textured base, cast rubber wheels and a speckled paintjob on the soldier’s clothing to achieve a camoflage pattern.